Every year, since 1945, the illustration on the label is commissioned by an artist. The label can be a reference to a major historical event, or a tribute to the historic wine and its universe. Discover each label and their artists by clicking on the illustrations. 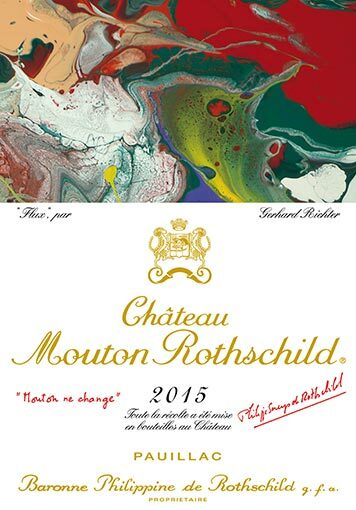 The label gracing the 2015 vintage is slightly different, influenced by the new generation in charge of the estate since the death of the Baroness, Philippine de Rothschild, in 2014. 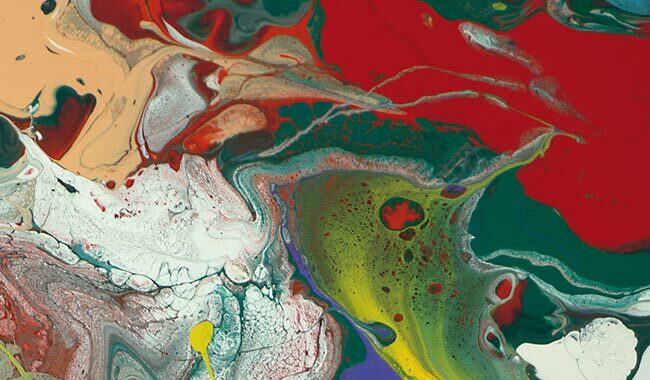 Entrusted to the German artist Gerhard Richter, this work (entitled "Flux") is actually a photograph illustrating an assembly of colors in motion. It refers to the blend of grape varieties that make up a great wine, complementing it and lending it the perfect balance. Born in 1932 in the German Democratic Republic (GDR), Richter first discovered artistic freedom during a trip to the West. Internationally recognized and awarded, his abstract works of art lie somewhere between photography and painting. 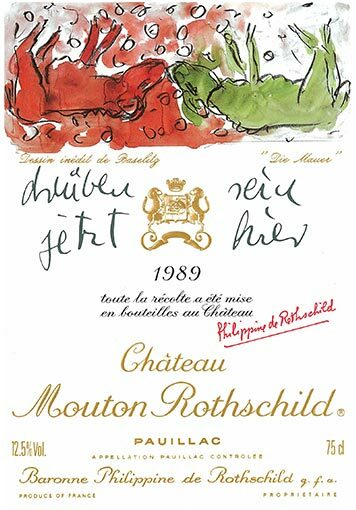 The year 2014 was marked by the passing of Baronne Philippine de Rothschild, the owner of the Mouton Rothschild estate since 1988. 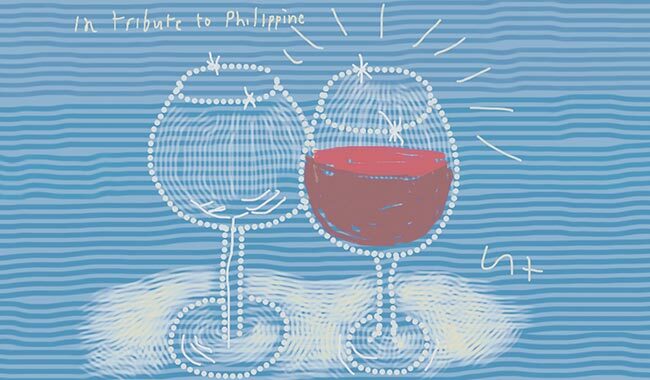 The label was a tribute to her, signed by her close personal friend David Hockney. Two glasses, one empty and the other filled, radiating light, which represents joy and astonishment. 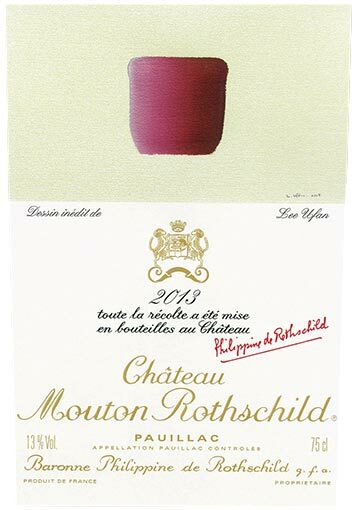 This piece tells the eternal miracle of the long awaited birth of a certain fine wine: Chateau Mouton Rothschild. David Hockney, born in 1937, masters many different painting techniques, from acrylics to the iPad, resting traditionally with painting people and objects using bright or contrasting colors. 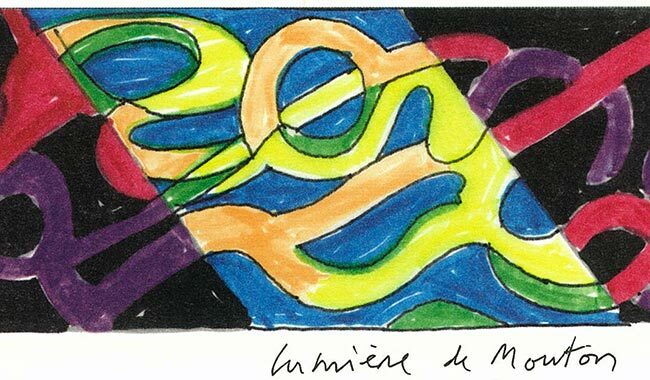 The illustration of the 2013 vintage was signed by Lee Ufan, a Korean artist and philosopher born in 1936. Under the purple red shape, the richness of a fine wine is hidden. Much like how wines are brought to life by the patience and secrecy of a cellar’s fermenting room. 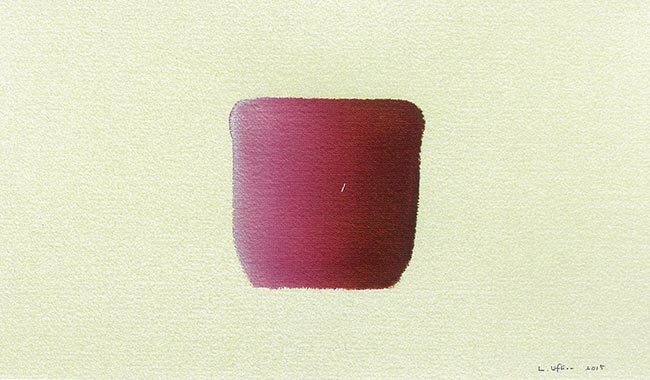 Lee Ufan received a traditional education but was very open-minded. He has lived in Japan since 1956, and became a philosopher after studying at Nihon University, Tokyo. Lee has received several prestigious rewards, such as the UNESCO Prize in 2000, and has his pieces exhibited all around the world. Some of his exhibits can be found in MOMA, Guggenheim or Biennale, Venice. 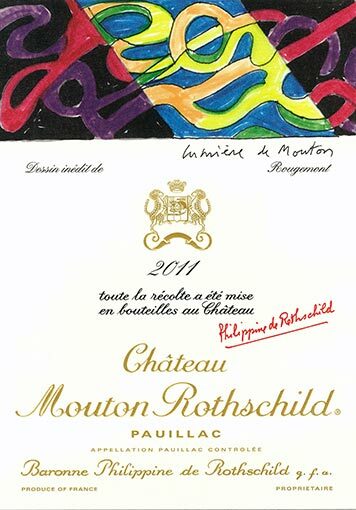 Miquel Barceló was hand-picked by Baronne Philippine de Rothschild as the artist of the 2012 Château Mouton Rothschild label. Barceló creates both a realistic and oneiric universe. With the vivid colors and several techniques and materials, the fresco creates a sense of relief. The artist is known for architectural works such as the interior of the Palma Cathedral in Spain and the Palace of Nations in Geneva, Switzerland. 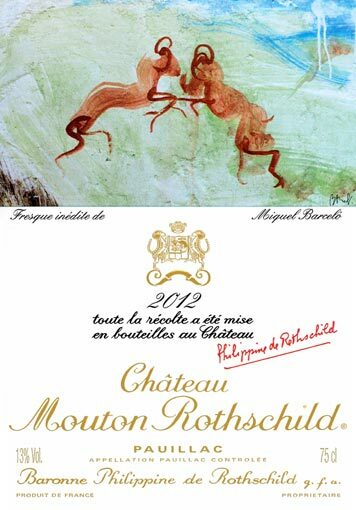 The historic emblem of the Mouton Rotshchild estate is two rams symmetrically disposed and facing each other. They remind us the importance of balance and harmony in a great wine, which is a gift from nature. Guy de Rougemont, born in 1935, is a French sculptor and member of the Fine Arts Academy in France. His painting style uses warm and contrasted colors with geometrical shapes. He also contrasts the rigid structure of geometrical shapes with fluid weaving shapes and lines. The purpose is to point out, or assuage, the contrasting shadows and lights. 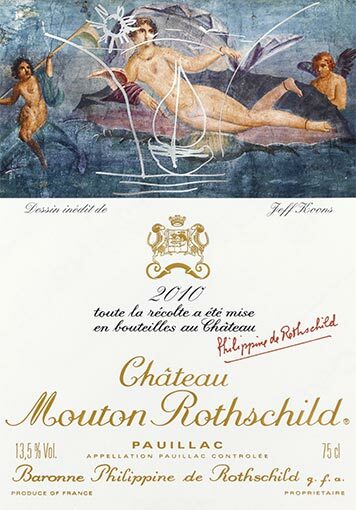 His style is well-represented on the Mouton Rothschild 2011 label. A red-dark color, symbolizing the darkness of a wine cellar to the brightness of sunny vineyards, the work of Rougemont takes us on a journey through the different steps of producing a fine wine. The 2010 vintage label was made by Jeff Koons, born in York, Pennsylvania 1955. He is an emblematic figure of modern arts. His work is based on Pop-Art and the “ready-made” style. His art is often discussed around the world, sometimes acclaimed, and sometimes argued. Jeff Koons is the creator of the Inflatable Rabbit. Recently, his work was exposed at Chateau de Versailles. In 2008, his Balloon Flower made him, for a moment, the world’s most expensive living artist. 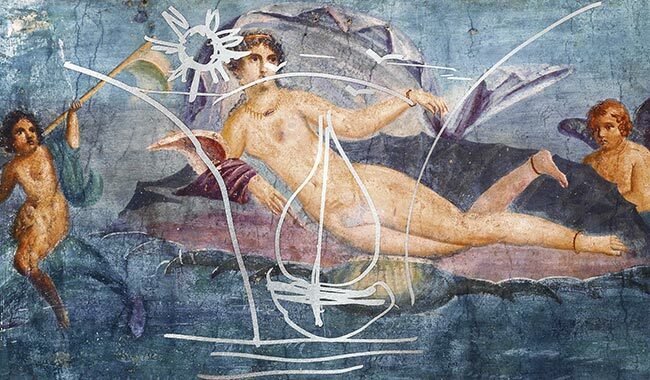 For this label, he revisits Antiquity with a fresco from Pompeii: Birth of Venus. As the fresco turns into a Venus with Vessel. The Vessel is both the cup which holds the ship which, under a bright sun, bears off into the distance with the most exquisite of wines. Anish Kapoor was the author of this 2009 label. 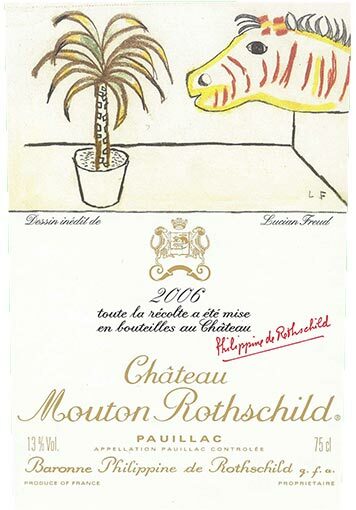 Austere, flamboyant and deep, the gouache created for Mouton Rothschild 2009 expresses a fertile thrust of plant life. It shows the result of the encounter between matter and light. Kapoor was born in Mumbai in 1954. After settling in England in 1972, he studied at Hornsey College of Arts and Chelsea School of Arts. 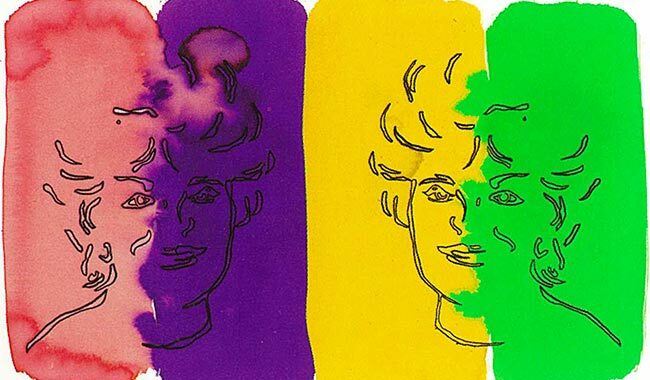 He gained notoriety very quickly due to his style using simple forms and bright colors. His work is everywhere on earth, from his massive Cloud Gate in Chicago or the Rockefeller Center in New York, and he is celebrated as a figure of contemporary art. Born in Berlin, the famous painter Lucian Freud (1922-2011) is the grandson of the founder of psychanalysis. Studying at the Central School of Arts and Crafts and then Goldsmith’s College, London, Lucian won the 1951 Art Council prize for the Festival of Britain. His travelling exhibition from 1987-1988 confirmed his place as a contemporary figurative realist, in Paris, Berlin, London and Washington. In 2008, one of his works was sold for the highest price ever attained by a living artist. 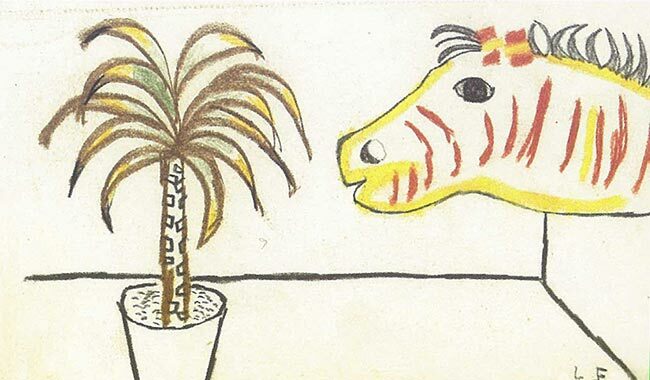 For the 2006 label, Lucian Freud chose an exotic transposition of the pleasure of drinking where the vine stock is transformed into a springing palm tree and the wine lover into...a zebra. 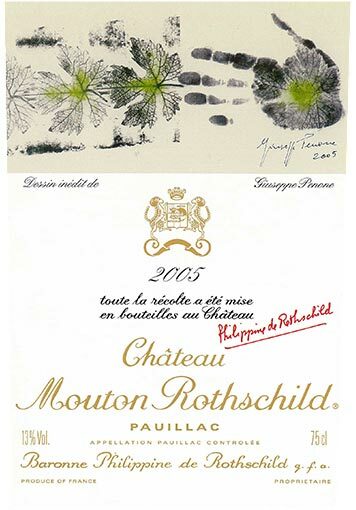 The 2005 label of Mouton Rothschild is a reference to the vine-grower's "green fingers", the vine leaves extend from the green hand. The hand is splayed, and will soon be grasping a glass of Mouton Rothschild. The author of this label is the Italian sculptor Giuseppe Penone (1947), one of the most original of our time. 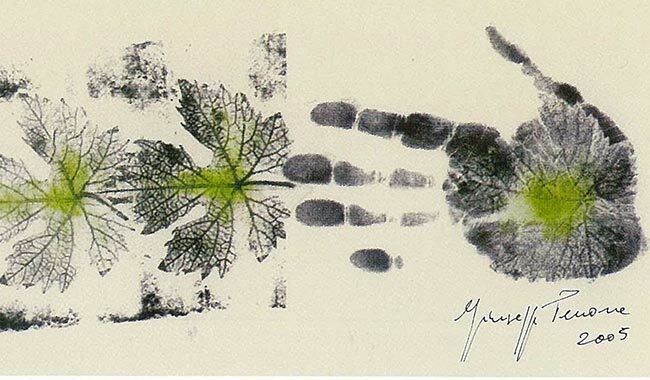 His attraction for shapes and colors from the vegetal and natural world is inherited from his father who was a farmer. He uses multiple techniques such as molding, rubbing or imprinting. Welcomed in the greatest museums around the world, Penone's work is in a constant state of evolution. 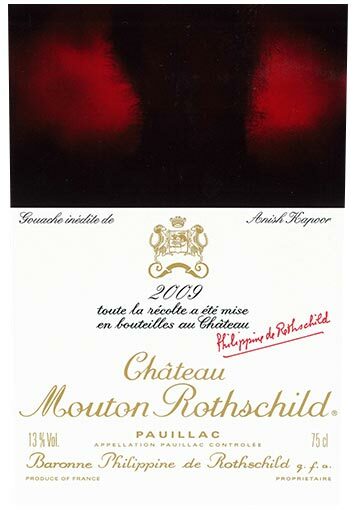 Originally dedicated to the wine world, Mouton Rothschild labels occasionally celebrate historical events. 2004 marked the centenary of the Entente Cordiale between France and Britain on April 8, 1904. The rivalry between the two nations was transformed into a friendship, with the help of King Edward VII. 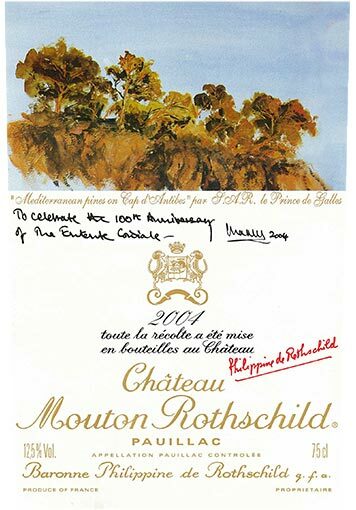 This commemoration led to many celebrations in 2004, including this label, after Baroness Philippine de Rothschild approached a talented artist and direct descendant of Edward VII: Prince Charles of Wales. Standing out against the azure sky, rooted in the depths of the soil, the pines depicted are in the image of the vine, fruit of the ever bountiful union of the sun and the earth. 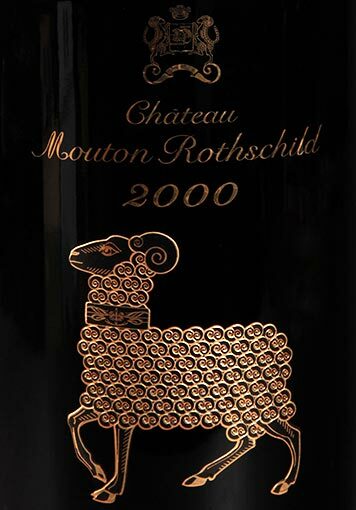 2003 was the 150th anniversary of Mouton's entry into the Rothschild's family, and has since belonged to the family for five generations. 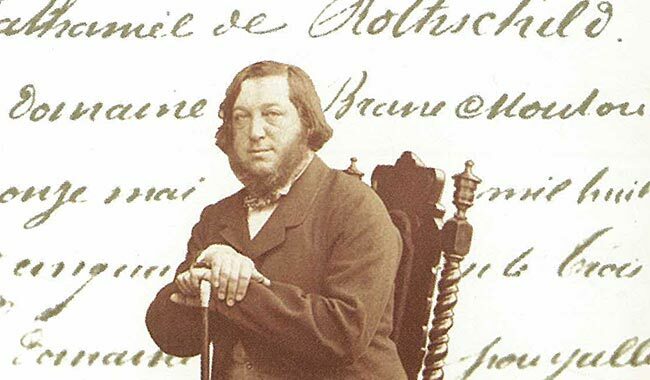 This label is dedicated to Baron Nathaniel de Rothschild (1812-1870), Baroness Philippine de Rothschild’s direct ancestor from the English branch of the family, who acquired the estate on May 11, 1853. Baron Nathaniel’s photograph is placed on a background, which is a close up of the estate’s deed of purchase. 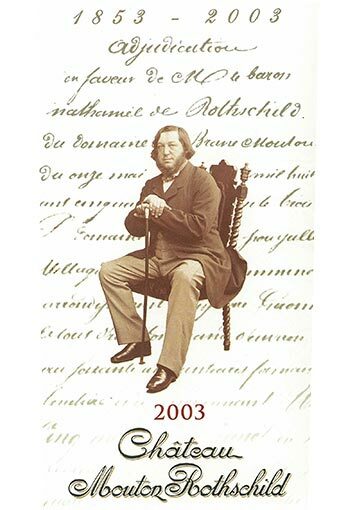 This document marked the beginning of a long love story between Rothschild's family and the great wines of Bordeaux. A Waco, Texas native, Robert Wilson (1941) was interested in sculptures and architecture. He then went through diverse theatrical experiences before the famous performance of Deafman Glance which made him quite popular in Europe. His performing career was confirmed by several more theatrical works such as A Letter for Queen Victoria (1974). In addition to theatre, his creative genius is expressed in a myriad of fields: paintings, furniture, installations and of course, the theatre. 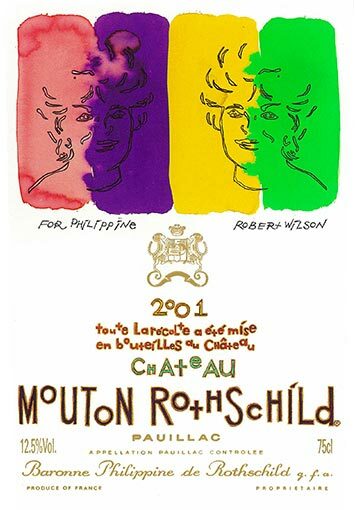 For the 2001 label, Robert Wilson chose to represent Baroness Philippine de Rothschild in multiple colors schemes in which the green of the vine shoots and the gold of the sun harmonizes with the chromatic scale of the wine, from light red to deep purple. 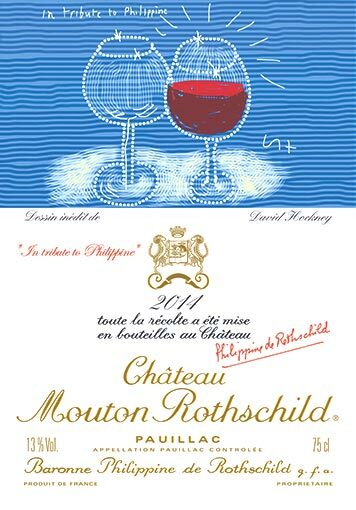 For the year 2000, which celebrates the new millennium, Baroness Philippine de Rothschild did not commission a painter. In fact, the bottle itself is a collector’s item for this year. The glass is adorned with a treasure from the Museum of Wine in Art at Mouton: the little “Augsburg Ram”. The ram is the estate’s symbol and is in the family crest. The estate called the glass manufacturer B.S.N. for this special edition with a new technique of enameling in relief. A golden ring around the black foil mimics the design engraved on the ram’s collar and recalls the chased volutes of its body. 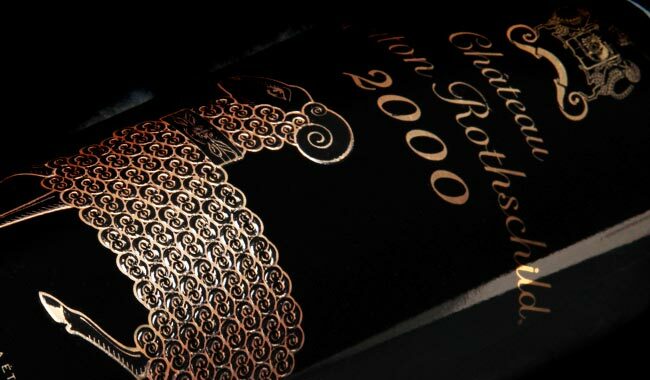 As a proof of authenticity the Château Mouton Rothschild name is engraved in the base. The 1999 label is from Raymond Savignac (1907-2002), a gifted caricaturist. 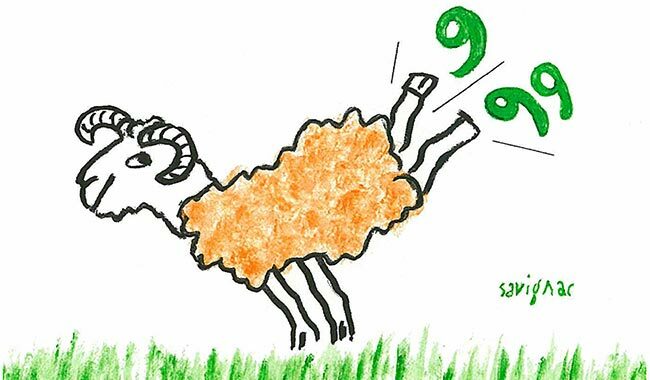 Representing the ram, the Mouton emblem, indulges us in the pleasure of wine-drinking and briskly dismisses the approaching millennium. He worked for advertisers, casting a humorous eye on the business world, also lending his talents to environmental and humanitarian causes. Raymond uses clean lines, vivid and contrasting colors, and goes straight to the point: a successful slogan. He received several distinctions such as the Grand Prix de l'Affiche, 1951 and also contributed to the image of many companies worldwide. 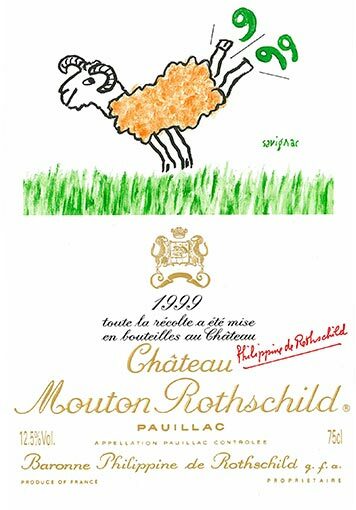 Savignac is not the first poster art artist to have signed a Mouton Rothschild label: Jean Carlu created the first poster art label in 1924. 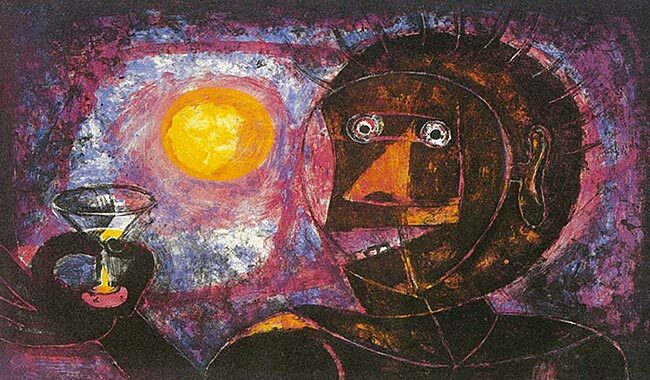 Born in Oaxaca, Mexico into a family of Zapotecan Indian origin, Rufino Tamayo (1899-1991) is one of the most renowned Mexican artists of the 20th century. 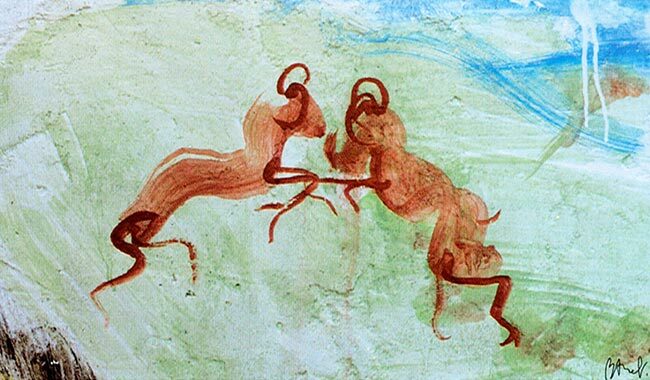 His art is inspired by the diversity of pre-Colombian art, abundant in rich colors and many shades of pastel. In his works, disturbing, even hallucinatory creatures seem to emanate all at once from an immemorial tradition and from the artist’s unconscious. Dividing his life and career between Mexico and the United States, Tamayo taught at Dalton School and then the Brooklyn Museum. 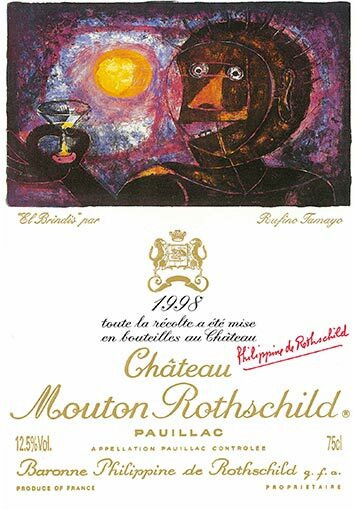 Despite his disappearance in 1991 -his work was chosen for the 1998 vintage- Tamayo's family gave Mouton Rothschild "Brindis", a man proposing a toast, a striking allegory of raw desire. 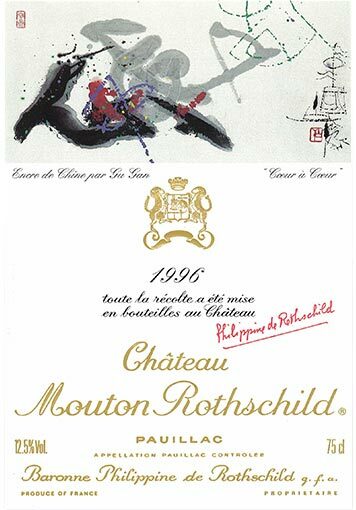 Gu Gan, born in 1942 in Changsha, was chosen for the 1996 label of Mouton Rothschild. During the cultural revolution in China, he was forced to work as a laborer in the printing industry. He was obligated to interrupt his art work until the fall of Mao and his regime in 1976. 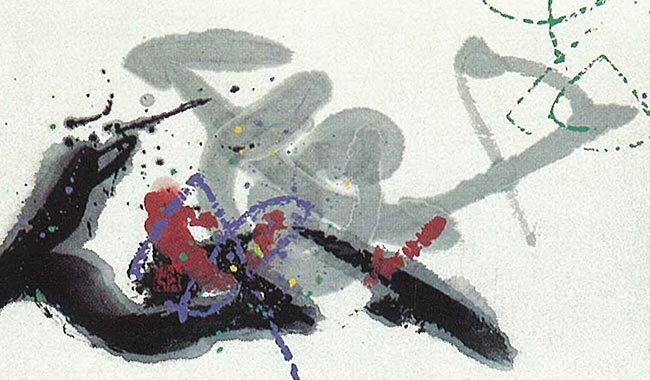 He is now the Chairman of the Association of Chinese Modern Painters and Calligraphers, and promoting the art and artists worldwide. Gu Gan has brought colors to calligraphy, which is an innovative approach, shaking off traditional restraints and the need for balance. For the 1996 label, Gu Gan designed five ideograms. Each ideogram represents the heart, varying the color and stroke of each. This piece, called "Heart to Heart" is intended as an act of faith in universal harmony. Born in Dublin, Francis Bacon (1909-1992) claimed that he finally found his style in 1945 while working on "Three Studies of Figures at the Foot of Crucifixion". 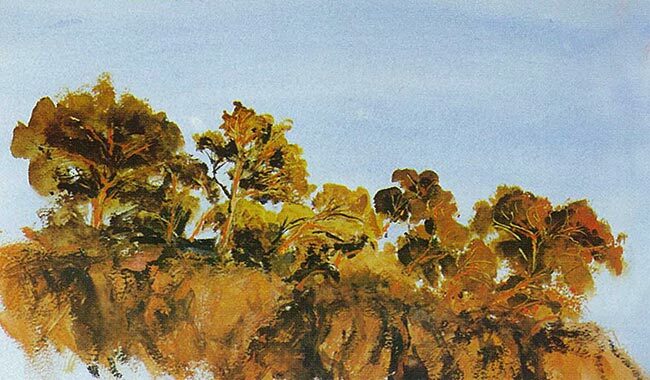 However, the artist was recognized as one of the greatest painters of the century in 1980. 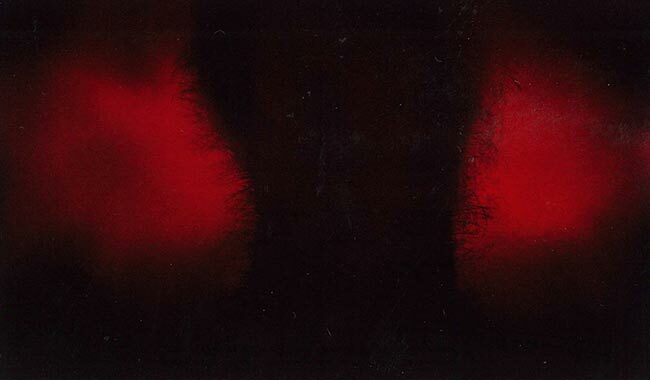 Rejecting his artistic recognition, Bacon exhibits naked flesh on flat painted backgrounds, with muscles contracting or stretching as if in a distorting mirror in his work. His painting style, dark and brutal, expresses angst towards the contemporary lifestyle. The artist once said "I have never been able to paint a smile". 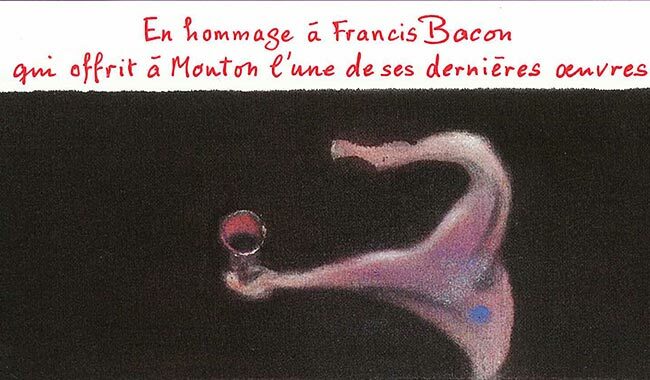 For the 1990 label of Mouton Rothschild, as a wine lover, Bacon created a wine-glass held by a mysterious distorted figure. 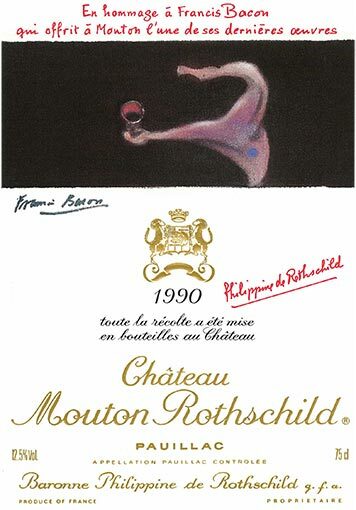 The two upside-down rams on the Mouton Rothschild 1989 labels are associated with the shocking event of 1989: the demolition of the Berlin Wall. Around the heraldry are the words “Drüben sein jetzt hier” – “Over there is now over here” a new and reunited Germany. 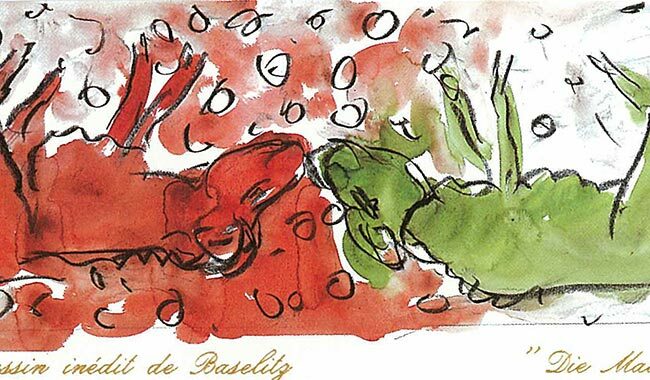 The artist, Hans Georg Kern Baselitz, born in Saxony in 1938 knew nothing about contemporary art until he left East Germany at the age of 20. Baselitz's style is provocative using images such as mutilated feet, distorted penises or frightening masks. "Upside-down" painting is a technique employed in all of his work, imposing a literal revolution on the way the public looks at the world.